2mins to NRG, 5mins to Museum district, Medical Center hospitals, 10-15mins to Downtown, Minute Maid Park, George Brown Convention! Hear yourself say WOW when you enter this sanctuary! "If it was possible I would rate it a 10 instead of a 5"
"If I am ever in Houston again, this is the place I would stay everytime"
"It was clear that the owner wanted us to have a positive experience"
Safe, peaceful GATED community in MEDICAL CENTER, down the street from NRG Stadium and tons of shopping and restaurants. Sleeping spaces: 3 bedrooms w/ their own full bathrooms. Extra pull-out mattress, convertible sofa & 3 air-beds available. Feeling and smelling like new, this home was built with upscale fixtures and construction material, and renovated for even more upscale standards. It has all the comforts and amenities that you expect in your own home or a luxury hotel! *More than 2000 sqft of space in this 3-story stand-alone town-home style home with two-car private connected garage. *3 bedrooms and 3 1/2 bathrooms. -- Extra twin mattress and queen size air-beds for additional sleeping space. *Wood floors throughout the home, except tiles in baths & entry-way. No carpeting. *Granite counter-tops, stainless steel appliances. *Large size high-end washer-dryer for all your laundry needs. *Small TV in bedroom downstairs and large 55” TV in living area with cable TV. *Gourmet equipped kitchen with microwave/oven, stove, dishwasher new dual coffee maker, blender, etc. *Adorable back yard to sit back and relax as well as nice GAS GRILL for barbecues! Gorgeous home is located in the Medical Center area. This central location puts you in the heart of several local attractions as well as hospitals. You are 2 miles (5 mins) from Fannin South rail station park n' ride that takes you to many of the attractions, universities in med center/downtown area. *The main hospital district is 3 miles away. *NRG Stadium is ONLY 2 miles away!! You are also close to educational institutes such of University of Houston and Rice University. Galveston is an hour away for beach and fun. Kemah Board-walk about 30 minutes away. 1. Access to the highest speed Wifi Internet available and Great HD flat TV entertainment that gives access to 140 channels. 2. A full kitchen with stainless steel appliances, name brand cookware, dinnerware, and utensils. 3. Single-serve & pot dual coffee-maker. And an amazing coffee grinder for the coffee connoisseurs. Blender, toaster & other small appliances. 4. A relaxing backyard balcony patio with a patio table and chairs to enjoy the beautiful weather while relaxing, reading or eating and a gas-fired barbecue grill. 5. In addition to fresh linens and bath towels, you will be provided with soap, shampoo, lotion, hair dryers, rowenta steam iron, and ironing board. 6. All closets, dressers and cabinets for your use. Extra blankets protected in vinyl blanket bags ready for use. 7. Free private garage parking. 8. Dual Air conditioning for upper and lower floors to have different cooling /heating temperatures. Emily (Landlord): I had many lovely passions in life, that is until I began to focus on raising children while working! Now that my oldest children are able to help me with my youngest, I have felt a sense of freedom, tempting me to focus again on the things that once interested me; Naturopathic medicine, reading, sports and business. There is great satisfaction in developing a service that is branded in quality, style, and class. I have traveled the globe myself, staying in many different types of accommodations, which has inspired me to create a series of fully equipped and furnished upscale housing for travelers both short-term and long that they can feel the difference between our housing and others. Quality furnishings with the added touches of someone who truly cares can make the difference between an okay trip and a great trip. I want for my customer what I would have wanted for myself in my traveling years. Moreover, when I finish a property, it is hard for me to leave as I want to live there myself! About our property manager who happens to be my father :) Roberto is bilingual (fluent English & Spanish) and a considerate eager manager always ready to tend to our customers. He is a Houston veteran and knows everything about this exciting city. He goes above and beyond in guest satisfaction. His job is to make your stay memorable! Roberto can be of assistance with anything. He will meet you as needed, and can arrange for extra maid services and other assistance. After months looking for the right property that was located just right, was safe and had upscale construction, I found this property and jumped on it. It is almost impossible to find a rental this size of house in the area. And I didn't cut any corners on its renovation (replaced all carpeting with hardwood or tiles) and the furnishing. My goal was to create an environment that I would want to live in myself, and spoil our guests with things they can not find in another rental. Everything was perfect for our Houston stay :) The townhouse is furnished and decorated beautifully. There is a garage, fenced courtyard, and balcony. The pantry was furnished with the basics so we didn’t have to buy foil, cooking spray, sugar, salt, pepper, paper towels, soap, etc. The freezer not only had an ice maker, but they had thoughtfully provided a bag of ice as well. The owner communicated well in the weeks leading up to our trip. The caretaker reached out to us upon our arrival and prior to our departure to offer assistance. We weren’t sure whether we would be bringing a dog with us and the owner was kind enough to leave that option open and only charge a pet cleaning fee if we did end up bringing a pup. We didn’t get to, but it would’ve been ideal if we had since it has a fenced courtyard and a nice area to walk dogs in the complex. I hope it’s available for every trip I take to Houston! We absolutely love this property. It is in an amazing gated community with very nice homes and neighbors. The home itself is extremely up-to-date, clean, organized, spacious and welcoming. The owner is very attentive to detail and love the new shampoo and body wash dispensers in the showers. The owner also does a great job making sure everything is great during the stay. Thank you for your hospitality! This house was a great home base for our family trip to explore Houston. It had plenty of space for a family of 5 to spread out and relax. The kitchen was very well equipped and everything was very neat and clean. My kids were very please with the speed of the internet. Our only complaint is that there were only 3 washrags in the house. Thanks Emily for hosting us in your rental property! Nice and clean, plenty of room, great stay!! The place was easy to find, nice location in gated community. Owner provided plenty of instruction on how to find and access property. When we arrived the property was clean and ready for our stay. All the amenities worked fine, WI-FI was good. Thoroughly enjoyed our weekend stay would definitely come back to this house! For my 32nd birthday, 6 of my girlfriends and myself decided to take an impromptu trip to Houston, TX. We booked this house literally the week of and never missed a beat. although there were some hiccups, that were not the fault of the owners, this trip, and this house were perfect. Apparently, the guest before us left the house in a mess, but we would have never known when we arrived. The house was spotless and even cleaned and ready early for us to check in due to our flight arrival time. The house had more than enough room for all 7 of us. And the beds are SOOOOOO COMFORTABLE. I have nothing bad to say. The bottom floor toilet was broken, due to the previous guest, and we didn't even care. Honestly we were so comfortable with the 3 other bathrooms we forgot to report it right away. I would stay at this house again in a sec. Thank you so much, Emily and team, for your hospitality!!!!! The condo looks even better in person. 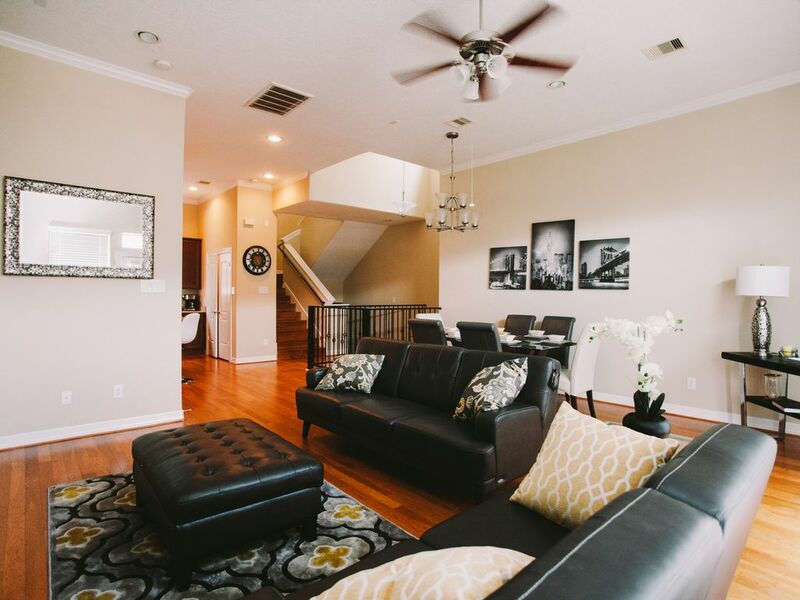 It is very spacious and it is in close proximity to the popular areas in Houston. I would definitely stay here again. (Christian) Houston Chinese Church, Catholic, Baptist, Seventh Day Baptist, Orthodox, Presbyterian, Methodist Churches. Rates are subject to change until reservation is confirmed. For larger payments, we can consider dividing payments into two payments. All payments have to be made prior to check-in.